New windows are a great way to improve the look of your home, but also a great way to save money each month on your energy bills. With more efficient windows, you can cut your energy bills significantly, saving you money in the long run. 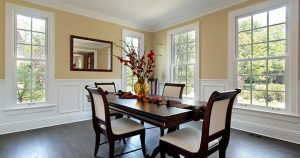 Why Choose Harvey Vinyl Windows? Harvey’s vinyl replacement windows are known for their beauty, energy efficiency, reliability, unsurpassed performance and numerous design options. They’re created to last, featuring thick wall, multi-chamber construction for unsurpassed strength to ensure a lifetime of performance. Also, while some companies actually use less-than-ideal vinyl that causes an unattractive blue-ish tint, Harvey uses 100% virgin vinyl for a true white color. Harvey also uses only top-of-the-line block and tackle balances, which never need adjustment and offer hassle-free fingertip operation. As a consumer, you’ll want to be aware of windows with inferior “spiral-style” balances which require frequent adjustment and become more difficult to operate over time. And, Harvey vinyl windows offer the convenience of tilt-in sashes for easy cleaning. You don’t want just any home-improvement company handling your window replacement. Jancon Exteriors and Harvey understand that as a homeowner, you take pride in your home. And, your home’s appearance is important to you. Our windows offer sleek designs to maximize glass area. Additionally, Harvey incorporates attractive, low profile hardware components that do not obstruct the view to the outside. So, whether you’re looking for double hung, casement, picture, rolling, awning, hopper, bay & bow, garden, single hung… or, designer shapes… Harvey and Jancon have you covered. For more information please feel free to reach out. We can be contacted over the phone at (508) 520-3935 or through our online contact form.